Designed to teach fundamental ideas as opposed to physics by formula. The primary goal is to expose basic properties of the atom, focusing on the description of experiments and data, both historical and current, used to establish physics principles. Contains 250 carefully worked single concept problems which demonstrate the thinking behind the answer and yield numerically significant results. Prerequisites include some exposure to classical mechanics and electromagnetism. 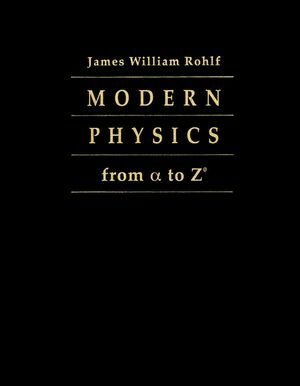 James William Rohlf is the author of Modern Physics from alpha to Z0, published by Wiley. Survey of Particles and Forces. Wave Properties of Particles and the Uncertainty Principle. High-Energy Physics: Classification of the Particles. High-Energy Physics: Unification of the Forces.